There's no dirtier job than being a pair of boardshorts: enduring sweaty car-seats, suffering through beer-soaked hijinks, and, if you're unlucky enough to belong to a non-poseur, getting scrunched up inside a wetsuit. Grab a pair that's up to the task, from Arbor. Based in Venice, Arbor's a skate/snowboard manufacturer with a laudable tendency towards Earth-friendliness (understandable, since their customers spend so much time eating dirt). To combat the effects of over-wearing/never-washing/ no-underwearing, their brand new boardshorts employ a bamboo/polypro blend that's quick-wicking (so you never have to dry them), and contains anti-bacterial/-fungal properties -- dramatically reducing odor, though putting you at risk of Panda Attack. 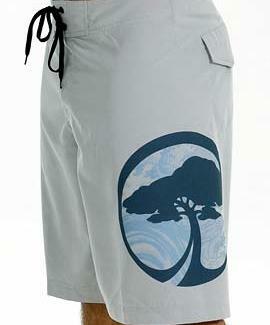 Boasting cargo pockets and drawstring closures, the shorts come in two designs: the Roundhouse -- a cypress bonzai tree painted by a Japanese artist more than a century ago -- and the Telephone, which depicts telephone poles and palm trees, in the rich Orange County style of 1990. Arbor also makes organic-cotton-and-bamboo hats, hoodies, and t-shirts, as well as belt buckles made with remnants from the snowboard manufacturing process, lending them the toughness needed to tackle another dirty job: being the last line of defense between the world and your junk.